For broader coverage of this topic, see Temporal rate. Frequency is the number of occurrences of a repeating event per unit of time. It is also referred to as temporal frequency, which emphasizes the contrast to spatial frequency and angular frequency. The period is the duration of time of one cycle in a repeating event, so the period is the reciprocal of the frequency. For example: if a newborn baby's heart beats at a frequency of 120 times a minute, its period—the time interval between beats—is half a second (60 seconds divided by 120 beats). Frequency is an important parameter used in science and engineering to specify the rate of oscillatory and vibratory phenomena, such as mechanical vibrations, audio signals (sound), radio waves, and light. These three dots are flashing, or cycling, periodically—from lowest frequency (0.5 hertz) to highest frequency (2.0 hertz), top to bottom. For each flashing dot: "f" is the frequency in hertz, (Hz)—or the number of events per second (cycles per second)—that the dot flashes; while "T" is the period, or time, in seconds (s) of each cycle, (the number of seconds per cycle). Note T and f are reciprocal values to each other. As time elapses—here moving left to right on the horizontal axis—the five sinusoidal waves vary, or cycle, regularly at different rates. The red wave (top) has the lowest frequency (cycles at the slowest rate) while the purple wave (bottom) has the highest frequency (cycles at the fastest rate). or ν (nu) (see e.g. Planck's formula). The SI derived unit of frequency is the hertz (Hz), named after the German physicist Heinrich Hertz. One hertz means that an event repeats once per second. If a TV has a refresh rate of 1 hertz the TV's screen will change (or refresh) its picture once a second. A previous name for this unit was cycles per second (cps). The SI unit for period is the second. 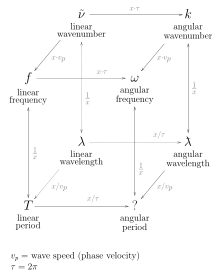 Diagram of the relationship between the different types of frequency and other wave properties. is the measured frequency. This error decreases with frequency, so it is generally a problem at low frequencies where the number of counts N is small. Higher frequencies are usually measured with a frequency counter. This is an electronic instrument which measures the frequency of an applied repetitive electronic signal and displays the result in hertz on a digital display. It uses digital logic to count the number of cycles during a time interval established by a precision quartz time base. Cyclic processes that are not electrical in nature, such as the rotation rate of a shaft, mechanical vibrations, or sound waves, can be converted to a repetitive electronic signal by transducers and the signal applied to a frequency counter. As of 2018, frequency counters can cover the range up to about 100 GHz. This represents the limit of direct counting methods; frequencies above this must be measured by indirect methods. ^ "Definition of FREQUENCY". Retrieved 3 October 2016. ^ "Definition of PERIOD". Retrieved 3 October 2016. ^ Davies, A. (1997). Handbook of Condition Monitoring: Techniques and Methodology. New York: Springer. ISBN 978-0-412-61320-3. ^ Bakshi, K.A. ; A.V. Bakshi; U.A. Bakshi (2008). Electronic Measurement Systems. US: Technical Publications. pp. 4–14. ISBN 978-81-8431-206-5. ^ "Definition of SOUND". Retrieved 3 October 2016. ^ Pilhofer, Michael (2007). Music Theory for Dummies. For Dummies. p. 97. ISBN 9780470167946. ^ Elert, Glenn; Timothy Condon (2003). "Frequency Range of Dog Hearing". The Physics Factbook. Retrieved 2008-10-22. Giancoli, D.C. (1988). Physics for Scientists and Engineers (2nd ed.). Prentice Hall. ISBN 978-0-13-669201-0.